Assa Abloy is the global leader in door opening solutions, founded in 1994 it has grown from a regional business into an international multi-billion-pound trading giant with over 43,000 employees and annual sales close to €7.3 billion. In 2012 Assa Abloy acquired Securistyle Group Holdings Limited in the UK who specialise in window hardware, high performance friction hinges, handles and window locks adding to their already outstanding portfolio. 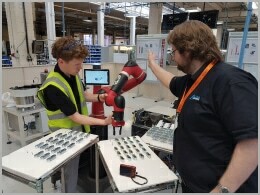 Active8 Robots initial engagement from Assa Abloy was from Plant Director, Harry Warrender, looking to automate existing production lines that were heavily reliant upon manual labour; in particular, the manual assembly and packing of high volume hinges, circa 18k pairs per day. 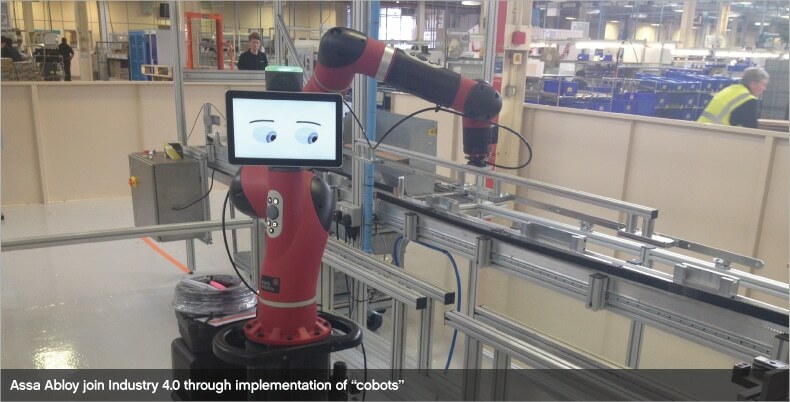 Harry’s initial focus was the Baxter Research Robot, the World’s first collaborative robot produced by Rethink Robotics, could the Baxter Robot automate these manual operations? To fully understand the tasks and advise the best solution for the customer Active8 Robots produced a comprehensive feasibility study reviewing traditional industrial robotic solutions and also collaborative robot solutions for the entire plant which also included the latest 3D Point Cloud Scanning. A significant element of the plant’s production revolves around the creation of glide arms used in the production of high end quality window solutions, through a series of manually tended pressing operations. Due to the volume, throughput and weight of the components being handled an ABB industrial robot solution was chosen for this application. A bespoke robotic cell was initially designed, developed and tested at Active8 Robots facility before delivery to site for final integration with a number of existing large industrial presses. The resulting bespoke press tending cell is a showcase at the Cheltenham plant and an impressive example of how state-of-the-art automation technology can significantly improve production and quality. 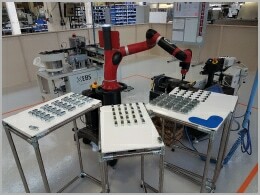 Shortly after the deployment of the custom press tending cell Active8 Robots successfully conducted on site evaluations with collaborative robots tending a number of smaller manually operated HARE presses (Manufactured by P.J. Hare Ltd). Sawyer, the newest and smartest collaborative robot in the family of robots from Rethink Robotics, was selected and deployed on site. Assa Abloy now have numerous Sawyer robots in a number of their plants across the globe and as they continue with their ground-breaking automation projects Sawyer will remain at the forefront. Active8 Robots are proud to be supporting Assa Abloy in their pursuit of the factory of the future. “In January 2016 we hosted the executive team from EMEA on site and we wanted to demonstrate our future vision of utilising collaborative robots throughout the business. To support the visit the team at Active8 showed their flexibility and willingness to support, by loaning us a Sawyer Robot for the purpose of a demonstration. The team from Active8 very accurately interpreted our vision and turned it into a real life simulation that clearly allowed us to demonstrate the concept to the executive team. Following internal evaluations and the experiences from earlier in the year we purchased 2 Sawyer Collaborative robots from Active8 Robots in April of this year to be used in our Portobello site. “Following the delivery of the Robots the team organised a day’s training and familiaristion with the equipment. The training was conducted in a friendly and informative manner where Horatio invited the participants to use the robots themselves to build confidence and learn the different functions and operating modes. Questions were invited throughout and the session ended with the team reviewing potential applications and discussing how different elements would be programmed which was particularly value added. Antony Lovedale Active8 Robots’ Chairman & Managing Director said: “We are thrilled to be working with Assa Abloy’s engineering & management team in the UK and are committed to delivering world class solutions for our customers”.